West Bromwich Albion vs. Chelsea : 17 November 2012. I left work on Friday, thrilled by the prospect of five straight days of holiday and, within that time frame, there would be two Chelsea games which I would attend. First up was an away trip up the M5 to West Bromwich Albion’s neat Hawthorns stadium, a mere 111 miles away. I didn’t have to be up there early. This was another solo-trip – no Parky – and I wasn’t in any particular mood to do much before the game. This would be a simple “in and out “affair. In truth, the drive up through a busy Bristol and up onto the motorway, then through the overcast countryside of Gloucestershire and Worcestershire, was rather dull. I listened to “Fighting Talk” on Five Live and then caught the opening section of that station’s football coverage. The drive took me two and a half hours, similar in length to a home game, and I was parked up at the Park Inn at 1.40pm. There was a long line at the bar and, to be honest, I had a headache and didn’t fancy a beer. A quick hello to a couple of acquaintances in the bar and I soon decided to head off to the stadium. The North London derby was on a TV screen, but I gave it scant regard. There was a time, before the M5 motorway ploughed right through the heart of the Black Country, when The Hawthorns probably felt like a natural extension of the historic town centre of West Bromwich. Now, the six-lane motorway dissects the two locales. The town centre is a mile to the west of junction 1 of the M5. The ground is isolated, cut off and disowned by the town centre, a few hundred yards to the east, surrounded by industrial units, a bakery, a McDonalds and a single housing estate. And yet, I’ve always liked trips to this stadium, set on a slight incline, with its angled floodlights being easily visible from the motorway as it bends and curves its way north. I suspect that this could be, in part, due to our fine record at this stadium. A fine record, that is, until last season when a lamentable performance spelled the end of Andre Villas-Boas’ short, and eventually unloved, term in charge of our team. This would be my eighth journey to The Hawthorns; the first six of these resulted in straight Chelsea wins. The seventh, was that 1-0 loss in March. I took the usual mix of photographs outside the stadium, which is clad in dull grey and navy steel, yet maintains a clean and trim feel. I was last in the area on my drive to Villa Park for the Community Shield in August, when our young team was still finding its footing. I took a few photographs of those angled floodlight pylons. There were times in the distant past when my sorties around the highways and byways – OK, the roads and railways – of this land were immortalised by shouts of “there’s Huddersfield’s ground” or “there’s Cardiff’s.” This was code for the fact that the floodlight pylons, rather than the stadia themselves, could be spotted, from maybe several miles away. It was somehow reassuring to know that they were still there; totems, if you like, for the stadium, for the club, for the respective communities which those clubs represented. These days, the lighting at stadia is more likely to be tucked under the roof of stands. The visual impact of those high and towering spider-webbed structures is, therefore, sadly missing from our urban landscape. It was always an anomaly of Stamford Bridge that, until 1994, we had three floodlight pylons, remnants from the days when the vast bowl was served by six pylons. In 1972, the three on the east side were taken down, leaving just the three on the west side. Spotting them from way out on an approach into London always got the pulses racing. A few girls were handing out fliers for a Status Quo album or gig. Talk about taking a step back in time. Bad music in the badlands of the Black Country. 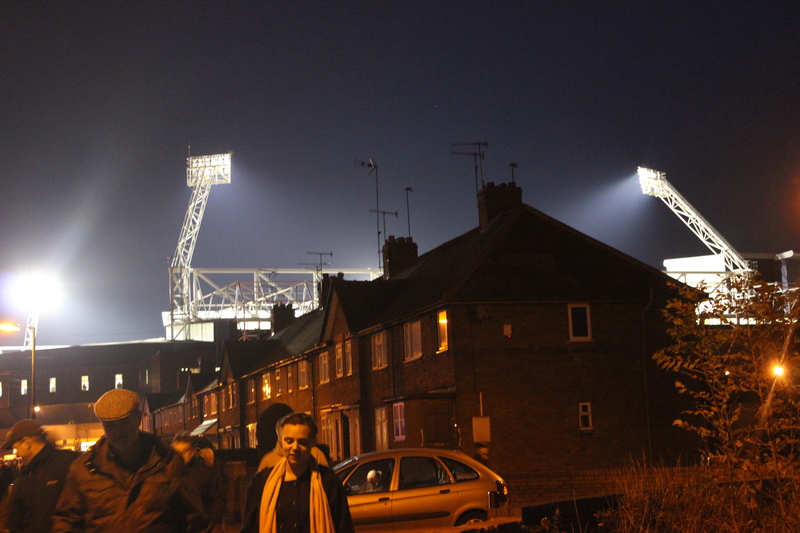 I also took a few photographs of the Jeff Astle gates, which are typically understated. Astle was a much-loved striker from the late ‘sixties and early ‘seventies, who sadly passed away in 2002. He was probably the Albion’s most famous son and appeared in Sir Alf’s 1970 World Cup squad. I met up with Alan and Gary, who were on the lookout for match badges. We walked down to the away entrance, where we chatted to the four Bristolians who frequent The Goose and all stadia east, west, north and south. Tim, one of the four, attended a Stiff Little Fingers concert with me in Bath on Monday. I had bumped into him at the same concert a year ago and, typically, I bumped into another Chelsea acquaintance – we recognised each other from The Goose – again this past Monday. Chelsea world gets smaller every year. Talk was of the team. It was certainly a surprising eleven; no doubt the upcoming game in Turin on Tuesday forced Di Matteo’s hand. Inside the stadium, we had great seats; in the first row above the walkway. Just before the teams entered the pitch, the resident DJ played the magnificent “Love Will Tear Us Apart” by Joy Division and then followed it up with sings by Oasis and The Killers. I certainly enjoyed hearing those three classic songs. Well done to the DJ. It sure beat Status Quo. The music changed to the classical sounds of “Carmina Burana” as the teams walked onto the pitch. “I need some Old Spice aftershave” I said to Gary. We began well, controlling possession, and a fine move down the left resulted in a Ryan Bertrand effort from inside the box being hacked off the line. However, our early smiles were turned to despair when West Brom worked the ball wide and the resulting cross was headed home by Shane Long, with the floundering David Luiz absent. Maybe Luiz was still finding a place to park his car at the Park Inn, maybe he was outside the stadium buying some pork scratchings, or maybe he was in a line at the nearby McDonalds. Joking apart, it was shocking defending. The locals celebrated by singing about one of their local rivals. Victor Moses seemed to be involved on the left, more so than Sturridge on the right. A shot from Moses and another from Mikel hardly troubled Myhill in the home goal, though. Over on the touchline stood the former team mates, Roberto Di Matteo and Steve Clarke. Wembley 1997 and all that. We still dominated possession but rarely threatened. Studge worked himself into the game, firing at the ‘keeper, but Torres was woefully absent from any worthwhile activity. At times it was as if we were playing without a centre-forward, perhaps like the famous Hungarian formation from the ‘fifties. Fernando Torres, however, is no Ferenc Puskas. A quick break involving that man Shane Long almost put us 2-0 down. Thankfully, we eventually broke through the well-marshalled ranks of striped defenders. An Azpilicueta cross deep into the West Brom six yard box was met by a rising Eden Hazard. I wasn’t sure how the ball managed to cross the line, but the net rippled and the Chelsea fans at last roared. To be honest, the away support had been pretty quiet until that point, with the noisy neighbours to our left providing more noise and variety. For some reason there was a heavy police presence in our end, with all of them looking our way. Maybe they had never seen Champions of Europe before. I captured the celebrations of the Chelsea players away in the distance, but was then reprimanded by a weasel of a steward who warned me that further use of my camera would result in it being confiscated. The home fans then responded to our eventual noise. “We know what we are. We know what we are. As the sun cast long shadows on the spectators in the far stand, the Chelsea fans replied with an old chant from the late ‘seventies; quite rare these days. There were mumbles and grumbles at half-time. The only players performing well, in my mind, were Mikel and Azpilicueta, though Moses and Bertrand were adequate. As the second-half began, the air grew colder. We again began well, with a strong run down the right flank, but Sturridge turned to shoot only at Myhill. It was to be the first of many misses during the second half from our frustrating number 23. Just as we appeared to be improving – “this is much better, Gal” – our error-prone defending let us down once again. Long was not charged down by Luiz and his quick cross was turned in by Odemwingie, with Bertrand unable to get close. The home fans roared again. The Lord’s Prayer – Psalm 23 – then had an airing and The Hawthorns was rocking. The songs continued. Chelsea were silent. On the hour, time for action. Oscar for Romeu. Mata for Torres. Soon after, two delightful balls from Juan Mata were lofted into the path of Sturridge, now playing centrally, but there was just too much “on” them. In truth, Studge did well to even reach the first with a header. However, despite the promising play from Mata, Studge’s two “misses” drew howls of derision. The Chelsea fans, at last, decided to get behind the team. In response, the home fans countered and for a few minutes the atmosphere was electric, just like a game from the days of yore. The chances still came for Daniel Sturridge. Mata played the ball through, and Sturridge only had the goalkeeper to beat, but the ball was on his “wrong” side. His right-footed shot was tame and was easily blocked by Myhill, who was now turning in quite a performance in the Albion goal. The best chance of the game again fell to Strurridge four minutes from time. Oscar, who had been playing in quite a withdrawn role, played the ball in but Sturridge screwed the ball wide. The Chelsea supporters had already decided that “enough was enough” and began to drift away. Two late corners, however, stopped the flow and the walkway in front of us became congested. Out came my camera to capture the last pieces of action. A short corner was played in by Mata and I snapped. The ball flew across the box and the sight of the yellow shirt of Petr Cech, flying through the air, at the far post caused a moment of supreme surprise and great expectation. I had not seen our ‘keeper arrive. It would have been some goal. Fair play to them, the baggy buggers, let them enjoy the night. Outside in the cold West Midlands night, the crescent of a waxing moon welcomed me as I hurriedly walked past the red brick of an old factory to my left. The Chelsea supporters around me were in a foul mood. Of course, I was far from happy either. I made my way past the onrushing home fans, battling the crowds, well aware that my solemn face did not match that of the locals. They were buzzing, to be fair. Steve Clarke has fashioned a hard-working team at West Brom. I wasn’t really sure if he would “cut it” as a stand-alone manager, but the dour Scot from Saltcoats has done a grand job. What of us? There were some below-average performances for sure. No need to mention names. Everyone knows who. However, I was later to learn that we had won twelve corners to West Brom’s zero. It certainly felt like we were always in with a chance of scoring. I think that a draw would have been a fair result. I got caught in some bad traffic as I tried to leave the area but, after ages, I found my way back onto the southbound M5. I just couldn’t be bothered with the radio. The United game would be referenced every five minutes and I couldn’t stomach that. Instead, Massive Attack accompanied me on the lonely trip home. I was typically melancholic as I drove on; dismayed by the result, but also with the standard of support from the away fans. At times, it was woeful. We were quiet at Swansea too. As I reached home, I flicked on my laptop and could hardly believe the news that Norwich City had defeated Manchester United at Carrow Road. What a shocker. I suspect that the United legions were all over the internet moaning about their manager, the under-performing players, the formation, the whole nine yards. They have already lost three out of their twelve games so far this season. This entry was posted in Season 2012-2013. and tagged 2012-2013, Andre Villas-Boas, David Luiz, Eden Hazard, Jeff Astle, Music, Roberto di Matteo, Stadia, Steve Clarke by Chris Axon. Bookmark the permalink.